Announcement As seen on the FYI Network show 'He Shed She Shed', Stylemepretty.com, Countryliving.com, Cesar's Way Magazine, Equestrian Magazine & Apartment Therapy! Foxy Modern Artisan Appliqué pillow covers featuring dog silhouettes, deer, horses, antlers, woodland animals & more! Each original design is lovingly sewn with meticulous attention to detail & quality. A modern take on traditional appliqué, every design is hand-cut from fabric; no plastic felt, paint, die cut machines or polyester screen prints manufactured by a third party here! Current Lead Time: Made-to-order just for you and will ship in 2 to 3 weeks. If you need an order shipped by a certain date, please contact me when placing your order. DID YOU KNOW? You can search my shop! If you are looking for a certain dog breed, design or color you can type keywords, "Goldendoodle", "Turquoise", etc. into the “search this shop” on my home page just above the featured items. As seen on the FYI Network show 'He Shed She Shed', Stylemepretty.com, Countryliving.com, Cesar's Way Magazine, Equestrian Magazine & Apartment Therapy! Foxy Modern Artisan Appliqué pillow covers featuring dog silhouettes, deer, horses, antlers, woodland animals & more! Each original design is lovingly sewn with meticulous attention to detail & quality. AS SEEN IN Cesar's Way Magazine, Equestrian Magazine, Your Home Magazine, Countryliving.com, Style Me Pretty, Southern Arrondissement & Apartment Therapy! A modern take on traditional appliqué, each pillow cover in the collection is an original design, lovingly sewn with meticulous attention to detail and quality in Winston-Salem, NC. Made-to-order just for you, every design is carefully hand-cut from fabric; no plastic felt, paint, die cut machines or polyester screen prints manufactured by a third party here! Before Vixen Goods, I worked as a design consultant in the floor covering industry. 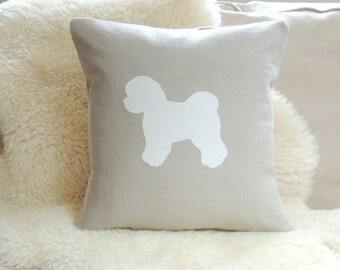 In the collection, you'll find dogs, deer, woodland animals, antlers, horses, monograms & other foxy goods. 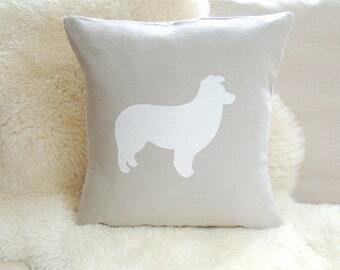 My dog pillow covers are designed to celebrate your trusty sidekick in a stylish way. Hi I'm Cara! I design and handcraft each pillow with my assistant, a Rough Collie chilling under my feet. Dubbed Velcro—he literally follows me everywhere—each design gets his final stamp of approval!